Just a few short weeks ago Democrats were aghast after Donald Trump claimed he might not accept the results of the election. Hillary Clinton claimed Donald Trump was “undermining the pillar of our democracy.” She also stated “we’ve accepted the outcomes when we may not have liked them.” But she was not alone: other Democrats and the mainstream media attacked Donald Trump as “un-American” for making such an outrageous statement and Democratic voters piled on. 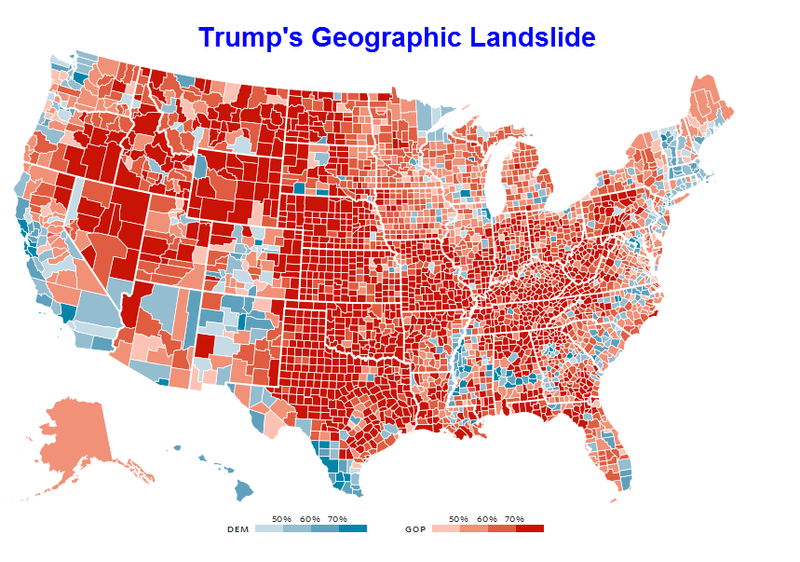 That massive blue block on the left – encompassing California, Oregon, Nevada and Washington state – stands out quite a bit against all of the red. So it may not be a huge surprise that people living in that Democrat-voting block are now looking at other options – specifically, secession. It was easy for the voters to talk tough when they bought into the mainstream media’s hype that Hillary Clinton had this election in the bag but now that they have lost they are showing their true colors. The truth is they only want people to accept the results when the results go their way, otherwise they are just as petulant as they accused Donald Trump as being. Force the thumb suckers to grow up. Bring back the military draft. No problem, let them take Oregon and Washingtom too and we will build a wall from Canada to Mexico to keep the assholes from sneaking in. Not a bad idea, Peter! I think that would be great! Pull all the Federal Facilities out of there. They would turn into Venezuela in no time. There has been a proposal to split the state into two states for awhile. Northern rural CA does not want the liberal urban southern half of the state. There was talk about splitting the state last year but I haven’t heard much about it lately, perhaps that will be back on the table now. Just like a body, when part of it is infected antibiotic or old fashion Apple Cider Vinegar and Cod Oil helps kills the invading entity. The goal is to contain it and eliminate it. If it begins to take over even more – like diabetes or a cancer – that part has to be cut off. BUT if that area can start to fight off the sickness itself (educated and equipped) then the body can be at one another and health! That seems to be the attitude of Trump – working together for a common goal and it isn’t Globalism or increasing the unhealthy take over! The Lie program = usurping the good word of liberal and perverting it as it did to the wonderful word gay (Sodomized it) needs to tramped down and out. Those youth (immature and ignorant adults) suffering from the ‘Cinderella, Pinocchio and Peter Pan syndrome’ (devised by the invading Borg Order to pollute and rewrite their programming from ‘Truth base’ to the ‘lie base’) is the killing spirit entity. Notice that each of those syndromes are from the Disney movies! How better to re-socialize and socially condition the masses but thru a ‘harmless animated cartoon’. CA is just an example of the libtards brainwashing. CA has resources that can be used for the Good of the body – the lie must be replaced by TRUTH. That was a pretty amazing video exposing the truth about the indoctrination, thanks for sharing it. There is a cartoon out now, I forget the name of it, that has a character called Bill, he is named after the dollar bill and is the pyramid with the all-seeing eye with arms and legs. They really aren’t hiding it anymore from those of us who know what it means. It was call Gravity Falls. Actually Bill’s destroyed … so what does that tell us? Who ordered the prune Danish? California would be Detroit if it wasn’t for the weather. Best thing for America would be for CA to fall into the ocean. Is that still an option, Bruce? Those climate change people are going to be really pissed off now! The West coast States values are a disease that moves East like a plague of Locusts. Let them have their way.